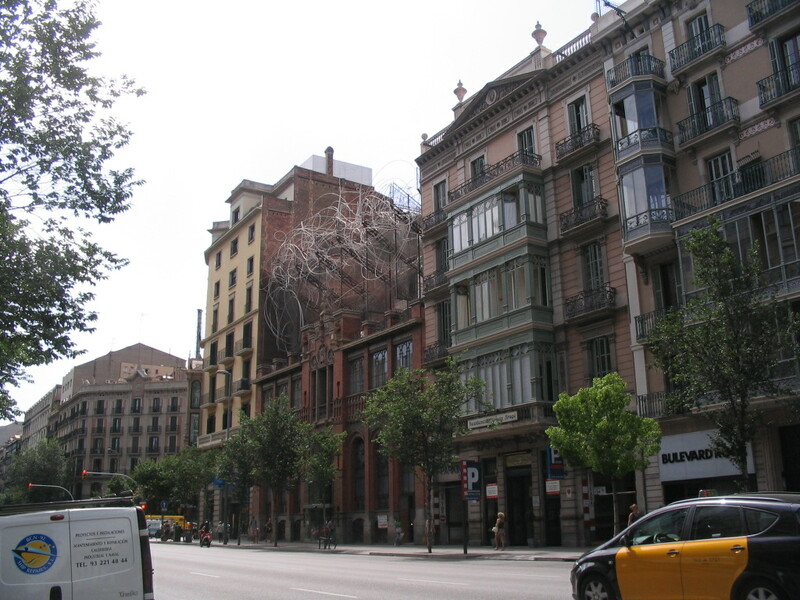 Reentering the Eixample, I proceeded down Passeig de Gràcia, a grand avenue chock-full of buildings by Gaudí and other Modernista architects. 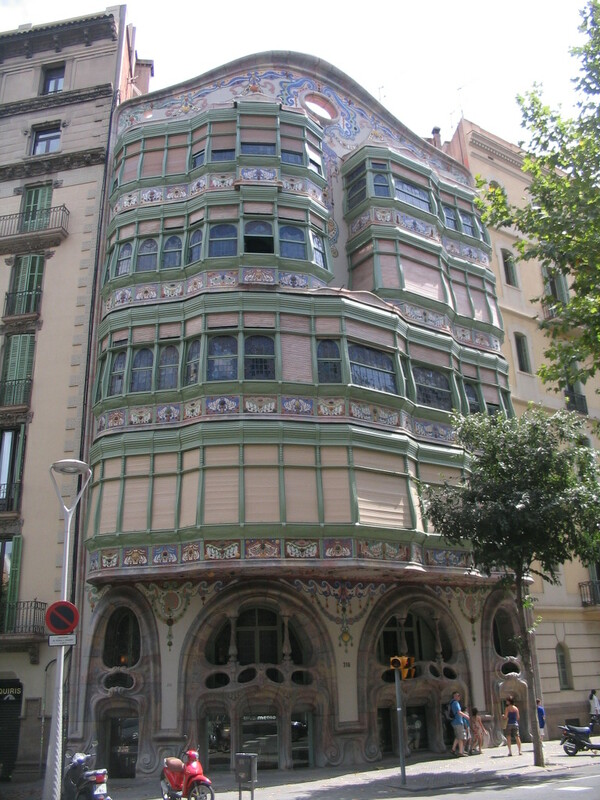 Just before getting to the Passeig, I went by the Casa Comalat, designed by Salvador Valeri i Pupurull and completed in 1911. 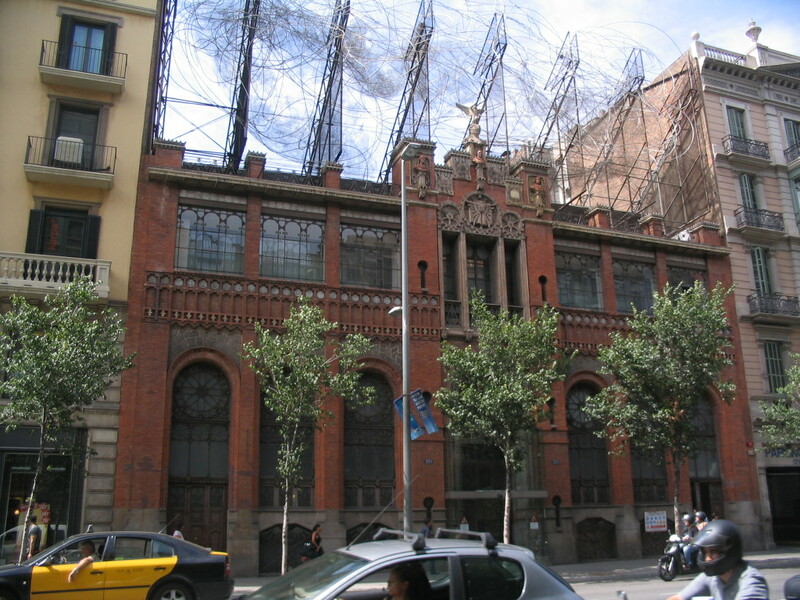 It sits in a small triangular block between Carrer de Còrsega, Av. 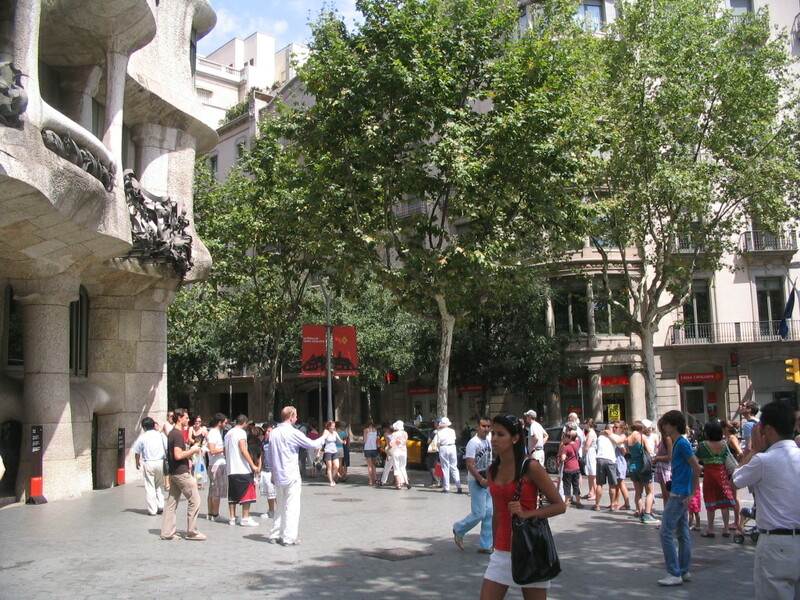 Diagonal, and Carrer de Pau Claris, and fronts on both Còrsega and Diagonal. 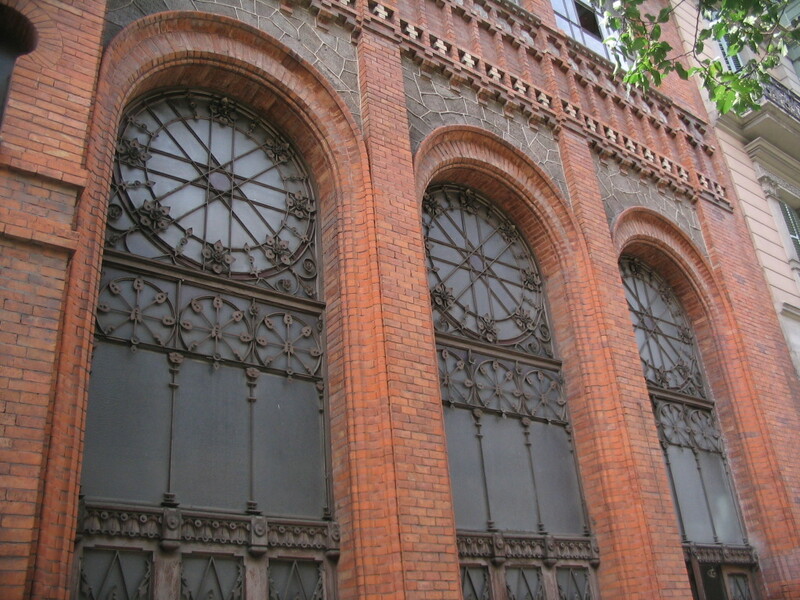 This is the Còrsega façade. 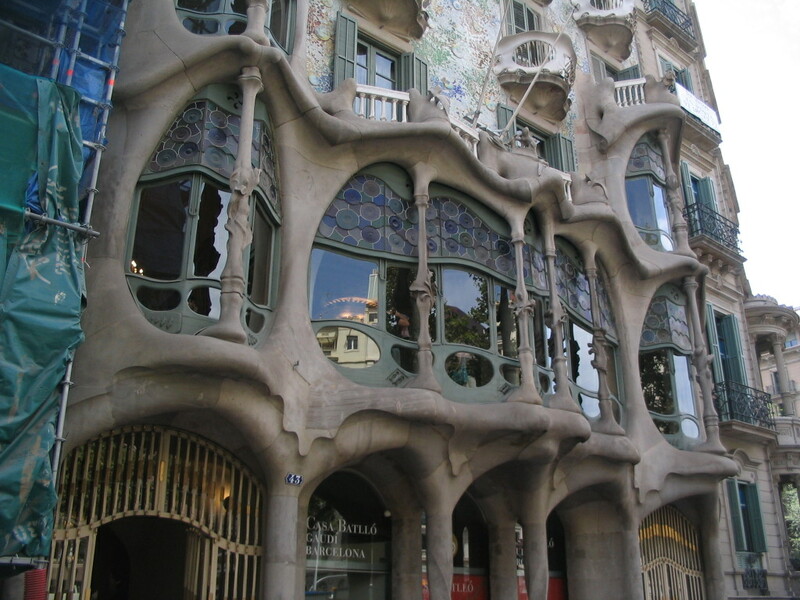 Gaudí's influence is clear in its biomorphic exuberance. 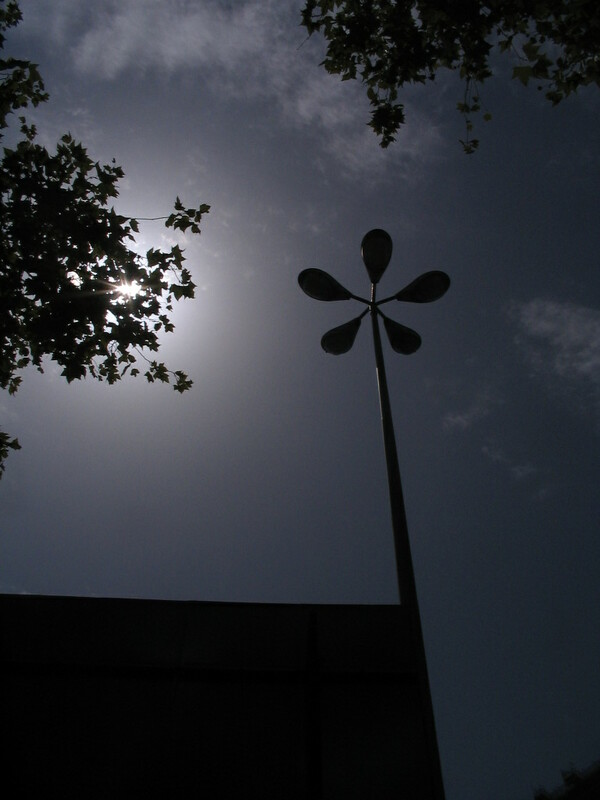 A five-lobed street lamp stands at the top of the Passeig like a robotic flower. 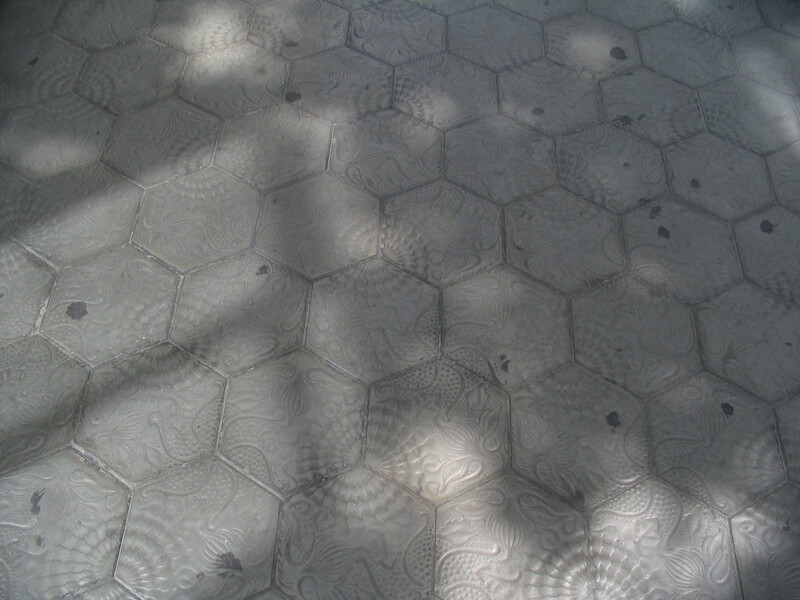 These sidewalk tiles all along the Passeig were designed or at least inspired by Gaudí. 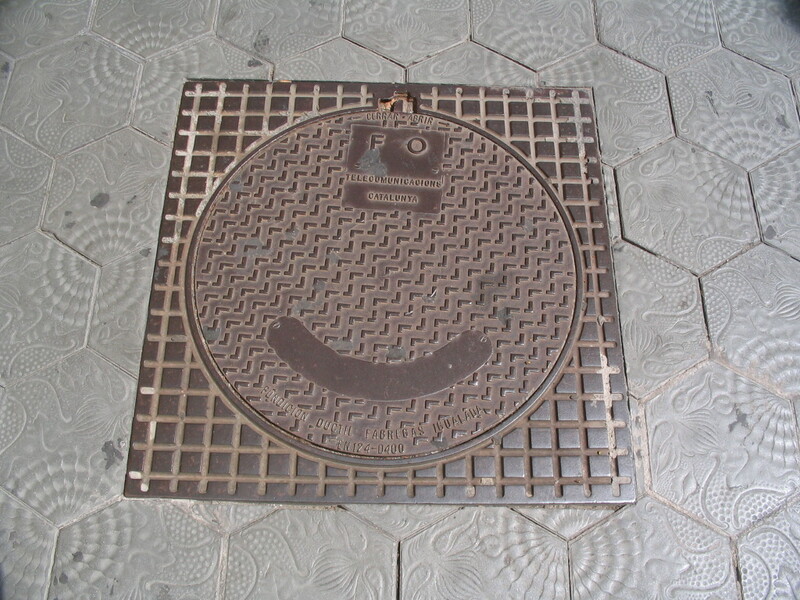 A perfectly content manhole cover. 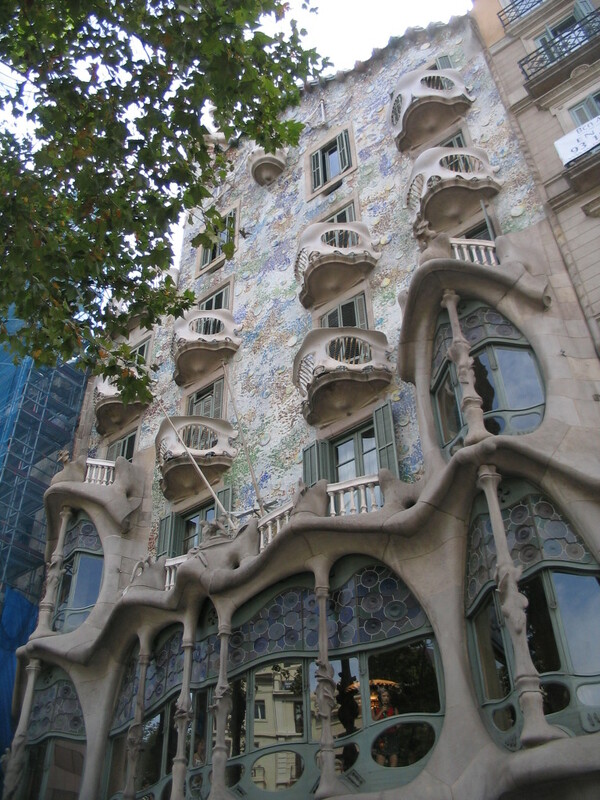 One of Gaudí's most famous buildings, Casa Milà, a.k.a. 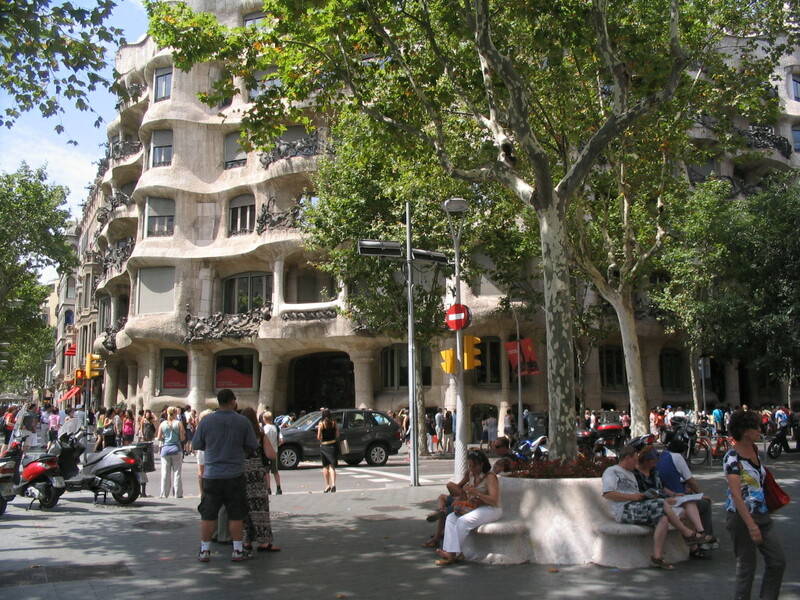 La Pedrera (The Quarry), is at the corner of Passeig de Gràcia and Carrer de Provença. I was going to tour it, but... oh, all these people are waiting to get inside? I didn't want to spend the time in line that I could spend exploring elsewhere, but I still got a good look at the incredible exterior. The façade does look monolithic, per its moniker, but like a monolith carved away through millennia of wind erosion. The balcony at top center appears to have a hole in it. Hmmmm. 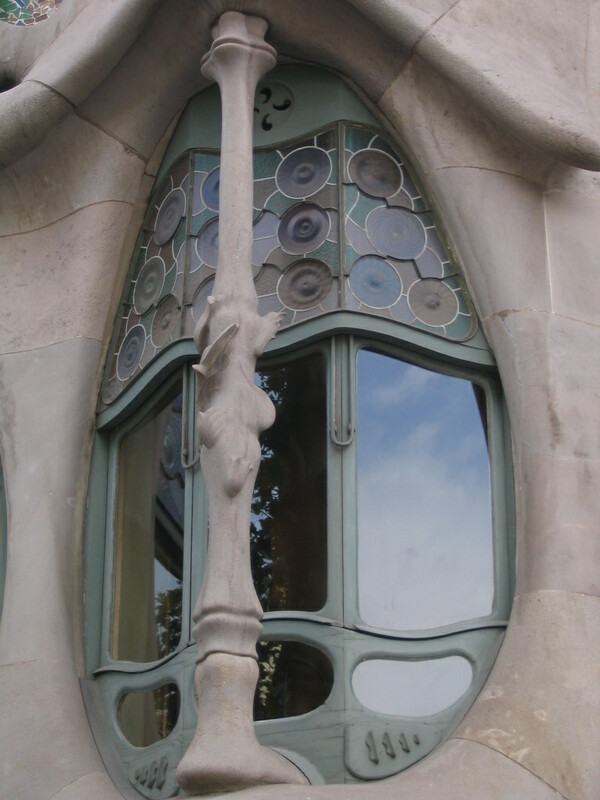 More recent fanciful façades are to be found along the Passeig as well. This is between Carrer de Provença and Carrer de Mallorca, and this renovation was less than a year old when I took the photo, judging by Street View. 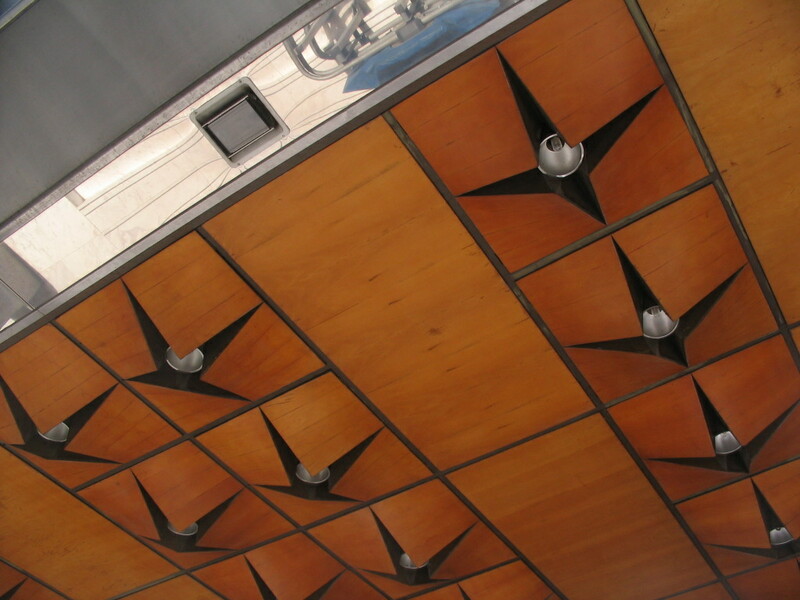 Across the way, a rather fetching array of beaked lights. The subtle curvature of the wood is pretty cool, and I love the warm hue. 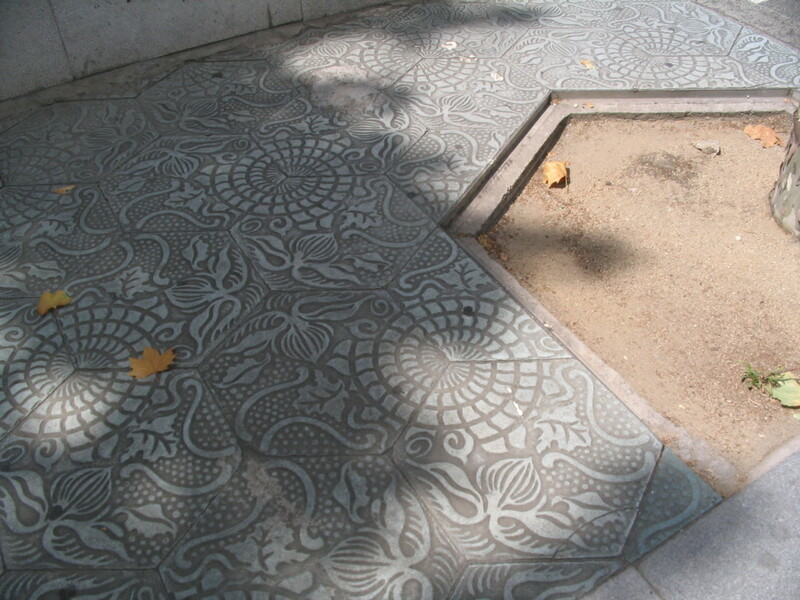 The sidewalk cutouts for the trees are cut to align with the hexagonal tiles, much to all obsessive designers' relief. 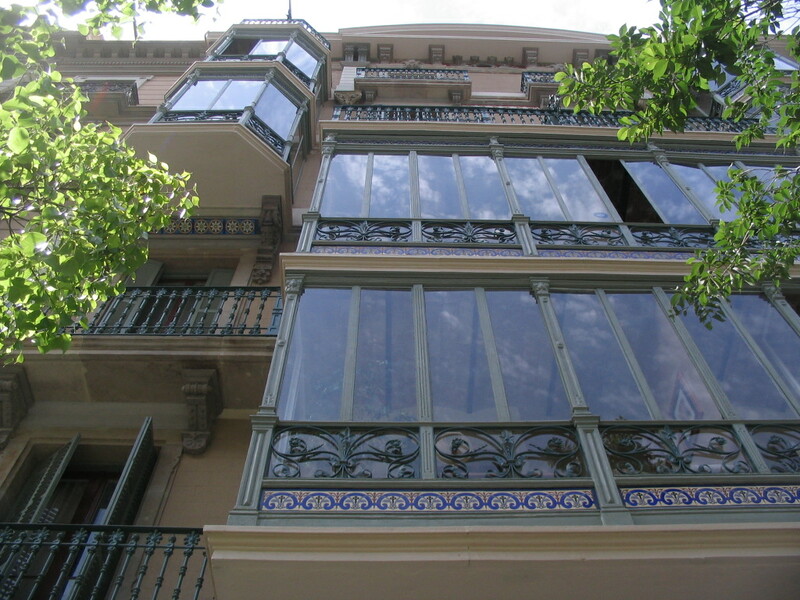 On a quick side cut southwest onto Carrer d'Aragó, a classily glassy building. Inside the lowest glazed volume can be seen some good ol' Catalan vaults. 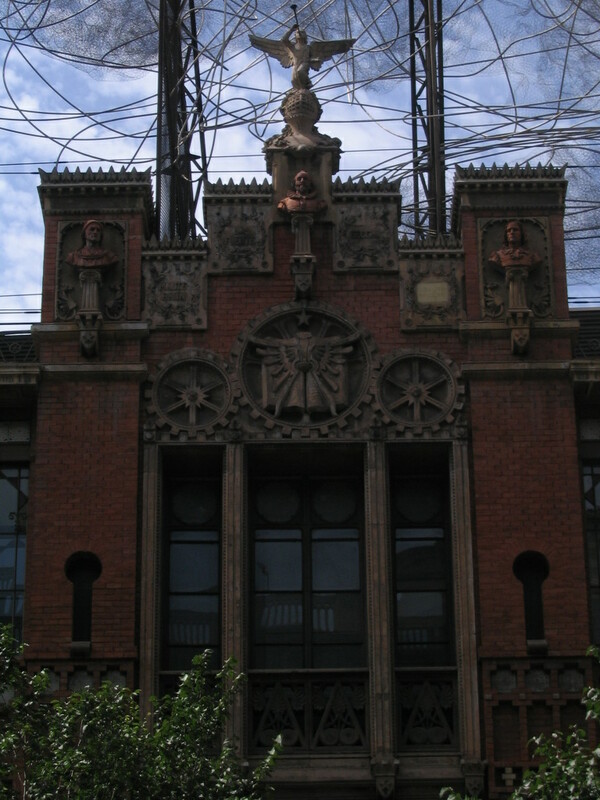 Two doors down is a very striking building indeed: the Fundació Antoni Tàpies, which was originally the Montaner i Simon publishing house, designed by Lluís Domènech i Montaner and completed in 1885 — a very early example of Modernisme. The brickwork and metalwork really tickle my fancy. 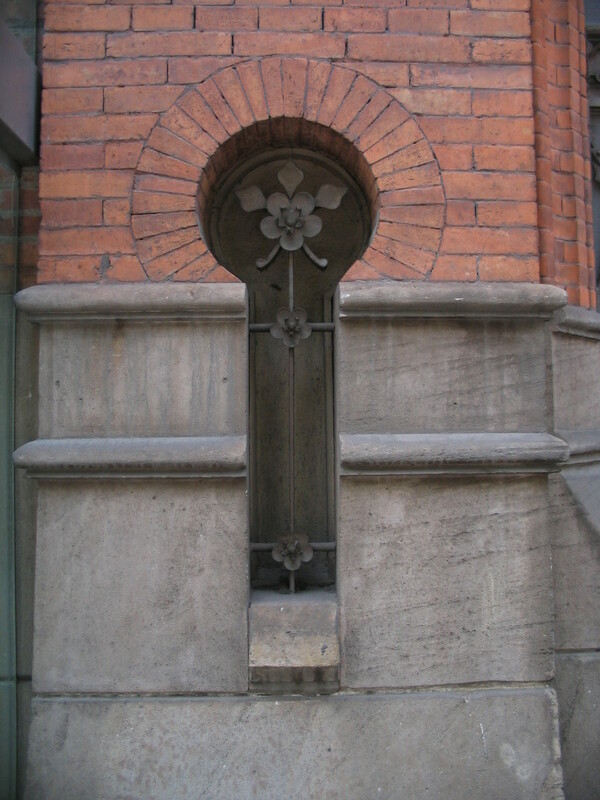 An exquisite windowlike yet opaque niche. A full view. Whoa! 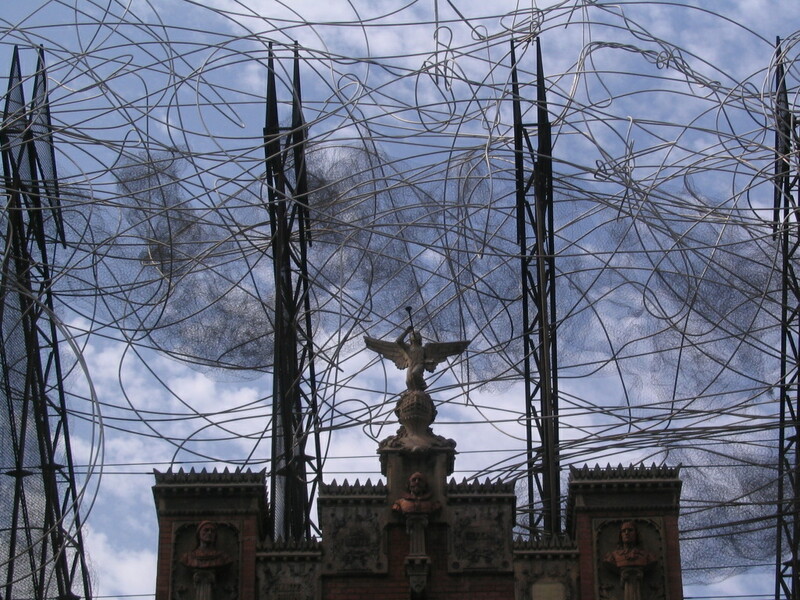 On top is Tàpies's sculpture Núvol i cadira (Cloud and Chair), created in 1990 for this location. 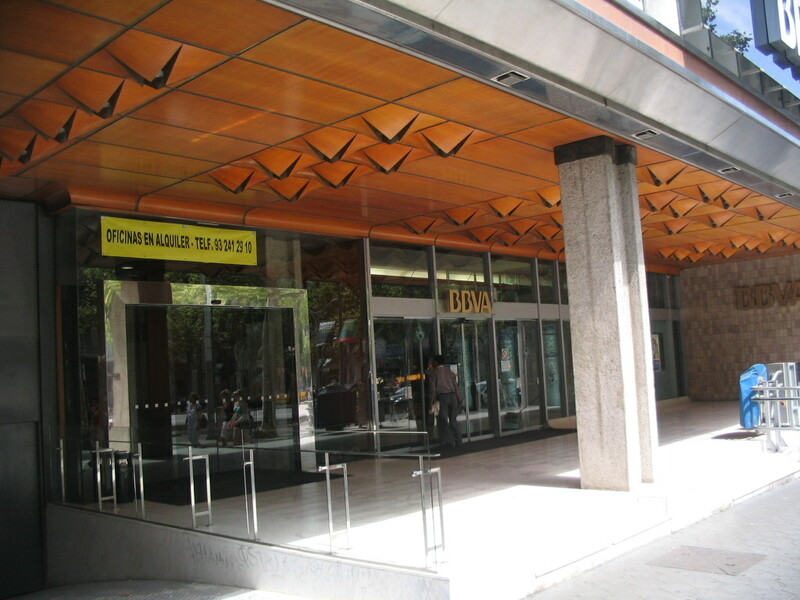 The central "pediment" is a really appealing composition too. 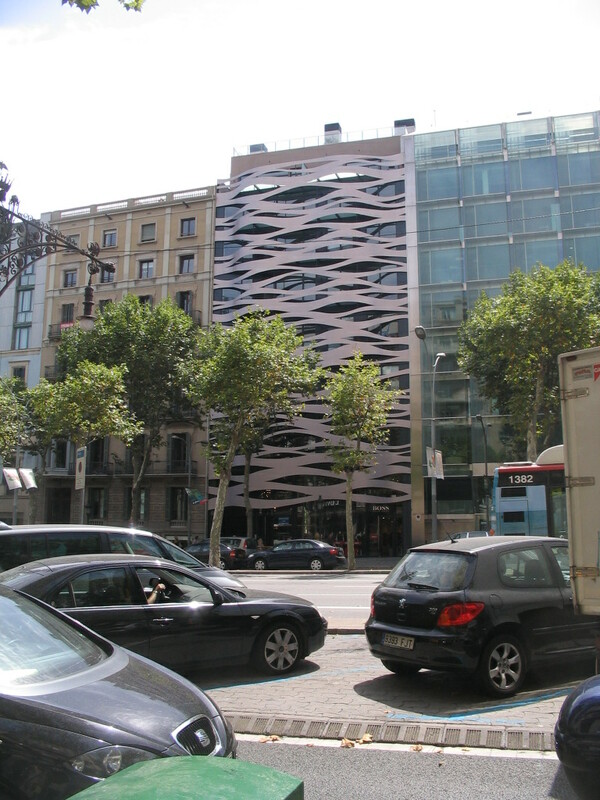 The view of the Fundació from back toward the Passeig de Gràcia. 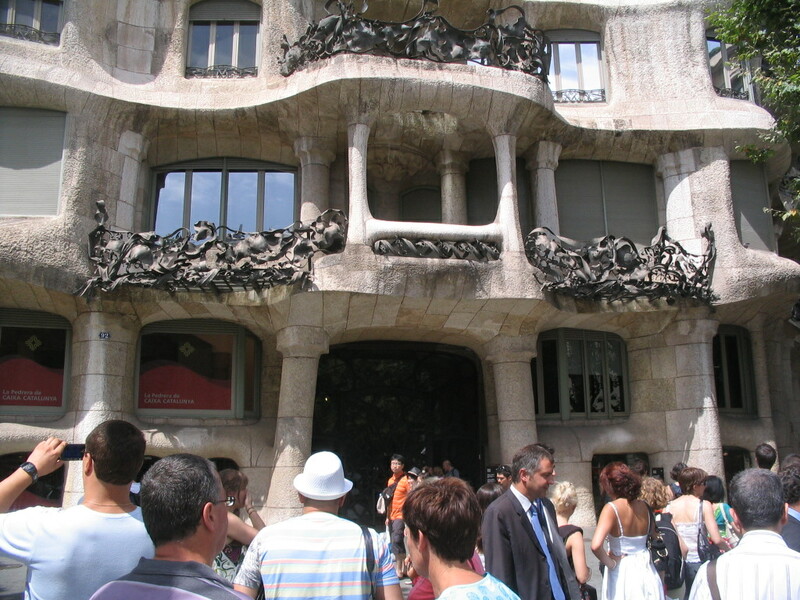 Casa Battló is another of Gaudí's most famous works, the 1906 renovation of an 1877 building. 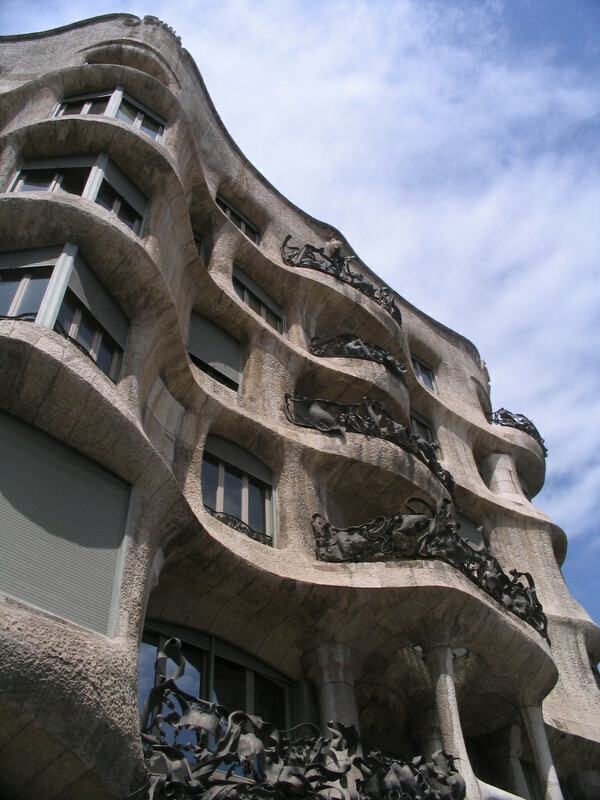 It's composed almost entirely of curved surfaces.